THE PORT OF PHILADELPHIA: Several 11,000-TEU vessels have already called at PAMT. The first two of four neopanamax cranes are due at the PhilaPort's Packer Avenue Marine Terminal. Ocean carriers are scheduling ultra large container vessels to call the port of Philadelphia. The Pilots' Association for the Bay and River Delaware conducted training for 12,000-14,000 TEU vessels. 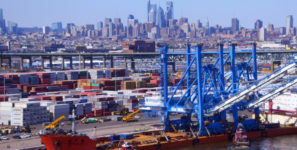 As the port’s $392 million main channel deepening project approaches 100-percent completion, cargo volumes in the Port of Philadelphia are surging. In 2017, container cargoes grew by 19 percent, leading all ports on the US Atlantic seaboard. The growth is especially significant since the port is busy implementing its $300 million capital improvement plan. Next month the first two of a total of four neopanamax cranes are due at the port’s Packer Avenue Marine Terminal (PAMT). Ocean carriers are already supporting the growth by scheduling ultra large container vessels (ULCV) to call the port. Several 11,000-TEU vessels started calling PAMT in December and 12,200 TEU vessels are expected in the coming days. Recently the board of directors of the Port of Philadelphia granted funds to the Pilots’ Association for the Bay and River Delaware to train for these new class of vessels 12,000 TEUs to 14,000 TEUs. The long-anticipated completion of the Delaware River Main Channel Deepening Project to 45 feet is drawing to a close. In March, the port expects announcements on a phased approach which will allow vessels to utilize increased arrival and departure draft depth.